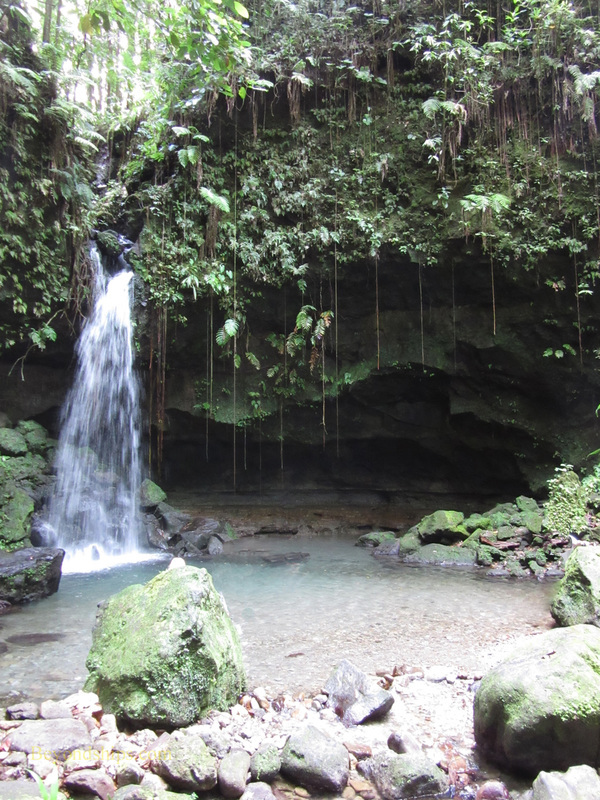 The Emerald Pool is the most visited natural attraction in Dominica's Morne Trois Piton National Park. A World Heritage Site, the Park also includes the Boiling Lake and the Valley of Desolation with its mud pools and geysers. The Park covers some 17,000 acres, mostly rain forest. A grotto with a pond fed by a small waterfall, the Emerald Pool gets its name because the pond reflects the greenery which surrounds it. 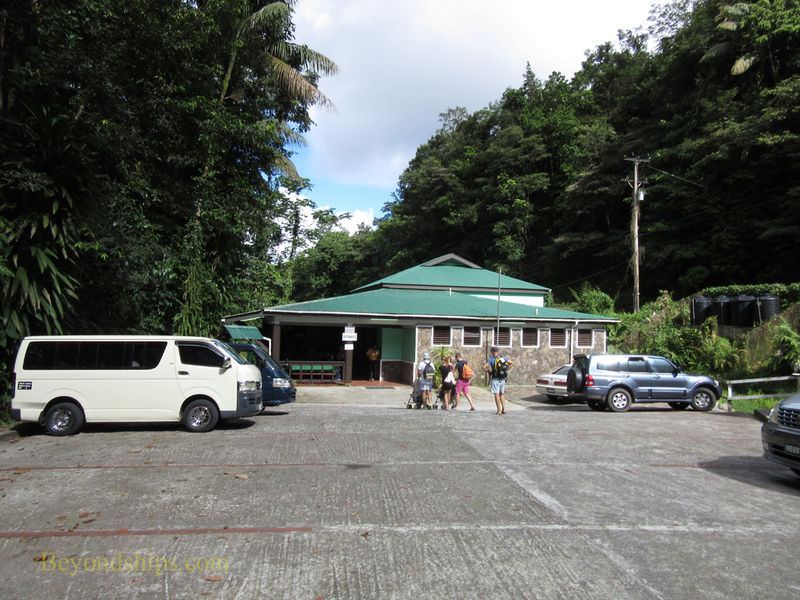 Surrounded by rain forest, the Pool is less than a half hour's walk from the visitor center. Visitors to the Pool can and do frolic in the cool water of the pond. While fun for the participants, this can be distracting for other visitors who just want to view the natural beauty. Some solitude can be found along the paths that have been laid out going to and from the Pool. These provide vistas of streams and gorges through the rain forest. 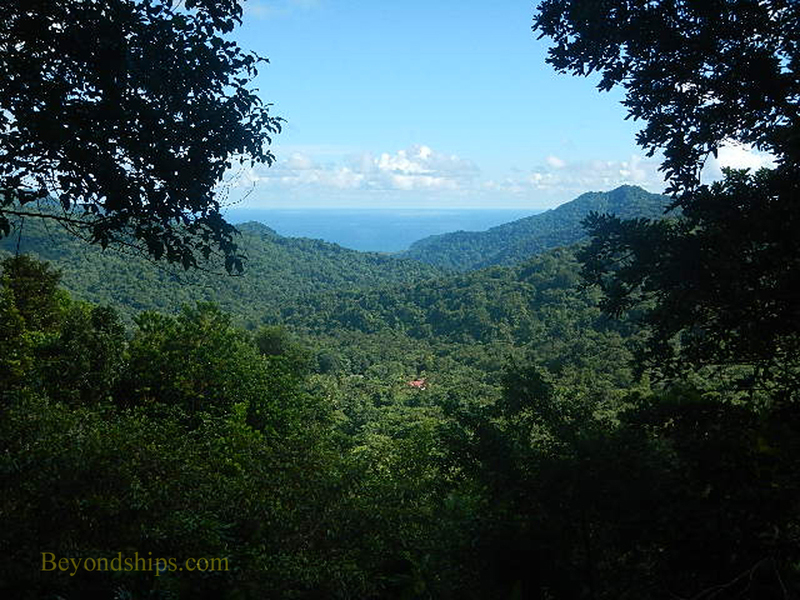 In addition, at some points, the foliage opens up to give a view of Dominica's mountains and the Atlantic Ocean beyond. The paths follow the undulating terrain of the Park and the ups and downs may be strenuous for some visitors. The Emerald Pool is only about 14 miles from Roseau as the crow flies. 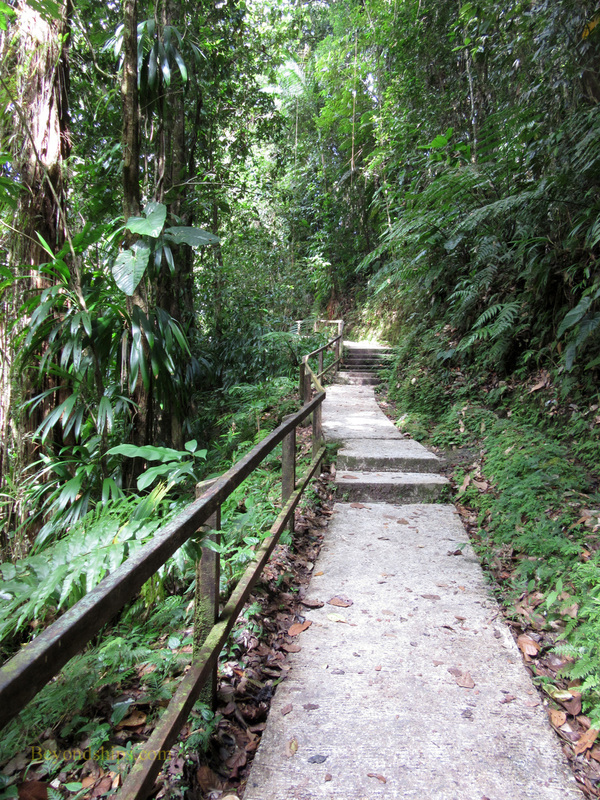 However, in order to get there, you have to traverse Dominica's mountainous terrain. The roads twist and turn and go up and down. Consequently, there is much braking and shifting, which those prone to car sickness may not appreciate. The scenery, however, is memorable. 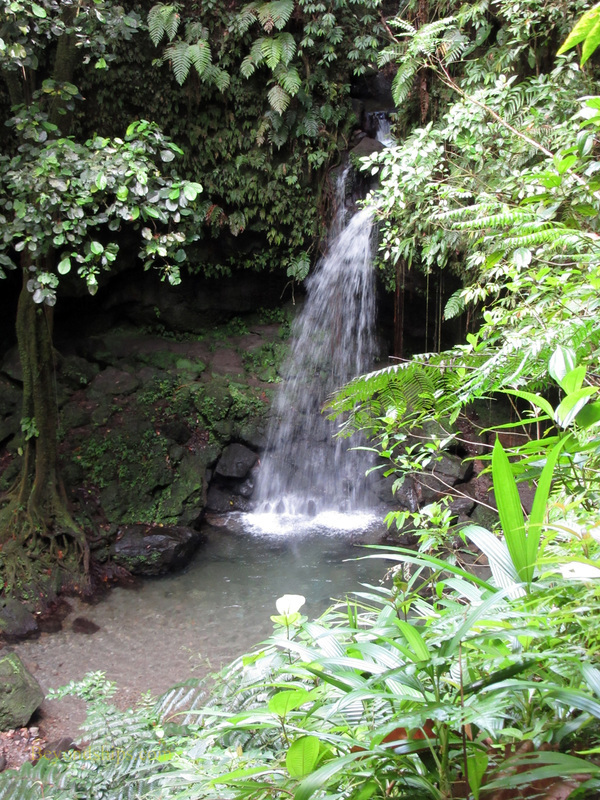 Once you leave the developed areas of Roseau, you travel through pristine forests with valleys, streams and waterfalls. 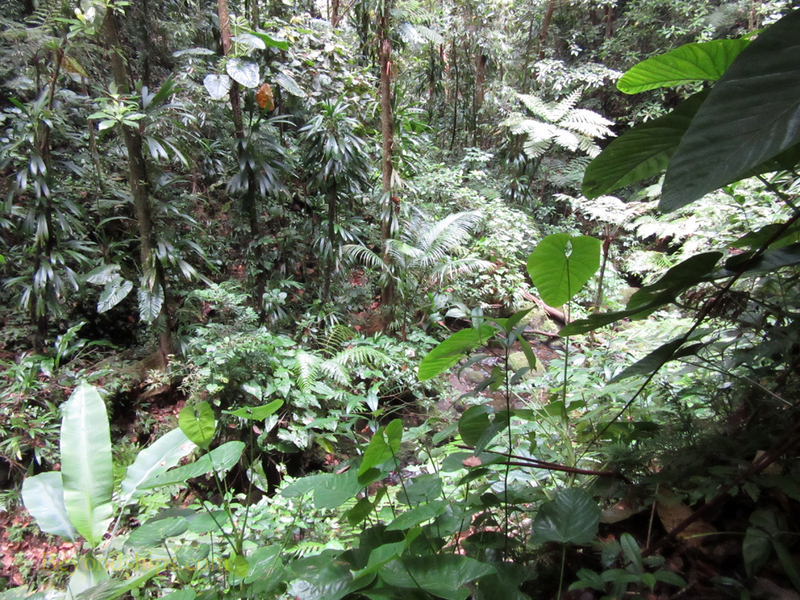 Below: A section of the path through the rain forest. Above left: A mountain gorge. Above right: A view across the mountains to the Atlantic.